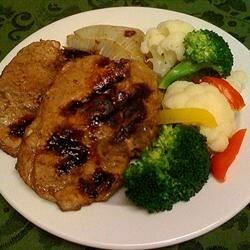 "Great way to prepare butterflied pork chops!" Good recipe. I didn't cut the pork chops open and I slowly cooked them on the stove-top rather than the barbecue. Tasted great and my husband loved them. Mmmm!So good!I didn't have any worcestershire sauce left the 2nd time I made this, so I used soy sauce(reduced amount) instead-Very tasty as well-and super moist! This was really good. Instead of the Pork Chop- I used the Pork Cutlett. I had to reduce the cook time to 20-25 minutes because the thinner meat. Mmmm this was delicious. My family is very big on garlic tho, so I added a little juice from refrigerated chopped Garlic (maybe a tsp) and it gave it just a little extra wonderful falvor. Very yummy. I used MUCH more honey, more like 3 Tbs. I also chopped up half an onion. I wasn't expecting to like this because I don't like Worcestershire sauce, but it didn't have a strong Worcestershire taste. It was really, really easy, and tasted great! The whole family loved it. They want me to make more. I added onions a 1/4 of one to mine and a little bit of Chili flakes.